The period between Christmas and Valentine's Day is traditionally a prime marketing time for wedding brands due to the spike in engagements. 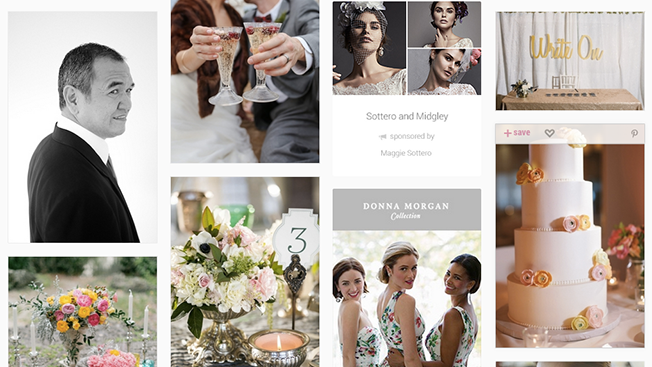 To capitalize on that, David's Bridal, Donna Morgan and Dessy are among a handful of brands testing a new advertising unit on the online wedding-planning site Lover.ly. The campaigns mark the first time that Lover.ly has offered paid ads to brands. Up until now, the site has functioned as a network of wedding bloggers and influencers who post wedding ideas and pictures to help brides plan the big day. Brands like Nordstrom and Macy's reported success with the model last year. Essentially, Lover.ly is offering marketers two types of ads. The first mimics a piece of editorial content that users and brands are already pushing out on the platform. The content is labeled as sponsored and pops up in the site's product feed, similar to Facebook and Twitter ads. Lover.ly users can also create digital folders—called bundles—to save items that they find around the site. Brands will be able to buy ads on those bundles that drive traffic to their profile pages. "[They can] use them as actual ad units," explained Peggy Fry, president and COO of Lover.ly. "The more people that love those bundles, the more popular they become on Lover.ly." Lover.ly claims to reach 3.5 million users across its site and mobile app. Per Fry, what differentiates Lover.ly for wedding-geared advertisers is the site's data about which stage of the wedding-planning process someone is in. Theoretically, that data can then be used by brands to better target ads to specific users with recommended content. "If we know that a user is a bride versus a bridesmaid or a guest, then we know that the first thing she'll do is book her venue or buy her wedding dress," Fry said. "It's really connecting the stage that you're in during your wedding planning experience along with other things that we know about her."